Wynton Learson Marsalis (born October 18, 1961) is an American virtuoso trumpeter, composer, teacher, and artistic director of Jazz at Lincoln Center. He has promoted classical and jazz music, often to young audiences. Marsalis has been awarded nine Grammy Awards and his Blood on the Fields was the first jazz composition to win the Pulitzer Prize for Music. He is the son of jazz musician Ellis Marsalis Jr. (pianist), grandson of Ellis Marsalis Sr., and brother of Branford (saxophonist), Delfeayo (trombonist), and Jason (drummer). Marsalis is the only musician to win a Grammy Award in jazz and classical during the same year. Marsalis was born in New Orleans, Louisiana, on October 18, 1961, though he grew up in Kenner. He is the second of six sons born to Delores Ferdinand and Ellis Marsalis Jr., a pianist and music teacher. He was named for jazz pianist Wynton Kelly. Branford Marsalis is his older brother and Jason Marsalis and Delfeayo Marsalis are younger. All three are jazz musicians. While sitting at a table with trumpeters Al Hirt, Miles Davis, and Clark Terry, his father jokingly suggested that he might as well get Wynton a trumpet, too. Hirt volunteered to give him one, so at the age of six Marsalis received his first trumpet. Although he owned a trumpet when he was six, he didn't practice much until he was 12. He attended Benjamin Franklin High School and the New Orleans Center for Creative Arts. He studied classical music at school and jazz at home with his father. He played in funk bands and a marching band led by Danny Barker. He performed on trumpet publicly as the only black musician in the New Orleans Civic Orchestra. After winning a music contest at fourteen, he performed a trumpet concerto by Joseph Haydn with the New Orleans Philharmonic. Two years later he performed Brandenburg Concerto No. 2 in F Major by Bach. At seventeen, he was the youngest musician admitted to Tanglewood Music Center. In 1979 he moved to New York City to attend Juilliard. He intended to pursue a career in classical music. In 1980 he toured Europe as a member of the Art Blakey big band, becoming a member of The Jazz Messengers and remaining with Blakey until 1982. He changed his mind about his career and turned to jazz. He has said that years of playing Blakey influenced his decision. He recorded for the first time with Blakey. One year later he went on tour with Herbie Hancock. After signing a contract with Columbia, he recorded his first solo album. In 1982 he established a quartet with his brother Branford, Kenny Kirkland, Charnett Moffett, and Jeff "Tain" Watts. When Branford and Kenny Kirkland left three years later to record and tour with Sting, Marsalis formed another quartet, this time with Marcus Roberts on piano, Robert Hurst on double bass, and Watts on drums. After a while the band expanded to include Wessell Anderson, Wycliffe Gordon, Eric Reed, Herlin Riley, Reginald Veal, and Todd Williams. When asked about influences on his playing style, he cites Duke Ellington, Miles Davis, Harry Sweets Edison, Clark Terry, Dizzy Gillespie, Jelly Roll Morton, Charlie Parker, Wayne Shorter, Thelonious Monk, Cootie Williams, Ray Nance, Maurice Andre, and Adolph Hofner. In 1987, Marsalis helped start the Classical Jazz summer concert series at Lincoln Center in New York City. The success of the series led to Jazz at Lincoln Center becoming a department at Lincoln Center, then to becoming an independent entity in 1996 with organizations such as the New York Philharmonic and the Metropolitan Opera. Marsalis became artistic director of the Center and the musical director of the band, the Jazz at Lincoln Center Orchestra. The orchestra performs at its home venue, Rose Hall, goes on tour, visits schools, appears on radio and television, and produces albums through its label, Blue Engine Records. In 2011, Marsalis and rock guitarist Eric Clapton performed together in a Jazz at Lincoln Center concert. The concert was recorded and released as the album Play the Blues: Live from Jazz at Lincoln Center. In 1995, he hosted the educational program Marsalis on Music on public television, while during the same year National Public Radio broadcast his series Making the Music. Both programs won the George Foster Peabody Award, the highest award given in journalism. 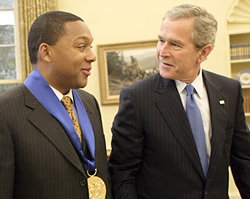 Marsalis received the National Medal of Arts from President George W. Bush in 2005. In 1983, at the age of 22, he became the only musician to win Grammy Awards in jazz and classical music during the same year. At the award ceremonies the next year, he won again in both categories. After his first album came out in 1982, Marsalis won polls in DownBeat magazine for Musician of the Year, Best Trumpeter, and Album of the Year. In 2017 he was one of the youngest members to be inducted into the DownBeat Hall of Fame. In 1997, he became the first jazz musician to win the Pulitzer Prize for Music for his oratorio Blood on the Fields. In a note to him, Zarin Mehta wrote, "I was not surprised at your winning the Pulitzer Prize for Blood on the Fields. It is a broad, beautifully painted canvas that impresses and inspires. It speaks to us all...I'm sure that, somewhere in the firmament, Buddy Bolden, Louis Armstrong and legions of others are smiling down on you." Wynton Marsalis has won the National Medal of Arts, the National Humanities Medal, and been named an NEA Jazz Master. Approximately seven million copies of his recordings have been sold worldwide. He has toured in 30 countries and on every continent except Antarctica. He was given the Louis Armstrong Memorial Medal and the Algur H. Meadows Award for Excellence in the Arts. He was inducted into the American Academy of Achievement and was dubbed an Honorary Dreamer by the I Have a Dream Foundation. The New York Urban League awarded Marsalis the Frederick Douglass Medallion for distinguished leadership. The American Arts Council presented him with the Arts Education Award. He won the Dutch Edison Award and the French Grand Prix du Disque. The Mayor of Vitoria, Spain, gave him the city's Gold Medal, its most coveted distinction. In 1996, Britain's senior conservatoire, the Royal Academy of Music, made him an honorary member, the Academy's highest decoration for a non-British citizen. The city of Marciac, France, erected a bronze statue in his honor. The French Ministry of Culture gave him the rank of Knight in the Order of Arts and Literature. In 2008 he received France's highest distinction, the insignia Chevalier of the Legion of Honour. He has received honorary degrees from New York University, Columbia, Connecticut College, Harvard, Howard, Northwestern, Princeton, Vermont, and the State University of New York. In The Jazz Book, the authors list what Marsalis considers to be the fundamentals of jazz: blues, standards, a swing beat, tonality, harmony, craftsmanship, and mastery of the tradition beginning with New Orleans jazz up to Ornette Coleman. He has little or no respect for free jazz, avant-garde, hip hop, fusion, European, or Asian jazz. Jazz critic Scott Yanow regards Marsalis as talented but criticized his "selective knowledge of jazz history" and has said that Marsalis considers "post-1965 avant-garde playing to be outside of jazz and 1970s fusion to be barren" and the unfortunate result of the "somewhat eccentric beliefs of Stanley Crouch". In The New York Times in 1997, pianist Keith Jarrett said Marsalis "imitates other people's styles too well...His music sounds like a high school trumpet player to me". When he met Miles Davis, one of his idols, Davis said, "So here's the police..." For his part, Marsalis compared Miles Davis's embrace of pop music to "a general who has betrayed his country." He called rap "hormone driven pop music" and said that hip hop "reinforces destructive behavior at home and influences the world's view of the Afro American in a decidedly negative direction." Marsalis responded to criticism by saying, "You can't enter a battle and expect not to get hurt." He said that losing the freedom to criticize is "to accept mob rule, it is a step back towards slavery." ^ a b Winkler, Alice (March 16, 2018). "What It Takes". VOA. Retrieved June 1, 2018. ^ Campbell, Mary (June 22, 1982). "Wynton Marsalis: Boy Wonder of Jazz Has Been 'Discovered'". The Day. AP. p. 21. Retrieved February 19, 2018. ^ a b c Yanow, Scott. "Wynton Marsalis". AllMusic. Retrieved May 22, 2018. ^ a b c d e f g h i j Berendt, Joachim-Ernst; Huesmann, Gunther (2009). The Jazz Book: From Ragtime to the 21st Century (7 ed.). Chicago, Illinois: Lawrence Hill Books. pp. 164–180. ISBN 978-1-55652820-0. ^ "Frequently Asked Questions". wyntonmarsalis.org. Retrieved May 26, 2018. ^ a b Russonello, Giovanni (September 13, 2017). "At 30, What Does Jazz at Lincoln Center Mean?". The New York Times. Retrieved June 1, 2018. ^ "History". Jazz at Lincoln Center. Retrieved June 1, 2018. ^ Pareles, Jon (July 2, 1996). "Critic's Notebook: Jelly Roll and the Duke Join Wolfgang and Ludwig". The New York Times. Retrieved June 1, 2018. ^ "Wynton Marsalis". Cbsnews.com. December 15, 2011. ^ "CuriosityStream Advisory Board". Retrieved August 31, 2015. ^ "Wynton Marsalis". cornell.edu. Retrieved April 8, 2018. ^ Morrisson, Allen (December 2017). "Building the Cathedral". DownBeat. Vol. 84 no. 12. Elmhurst, Illinois. pp. 32–37. ^ "Wynton Marsalis". www.atlantasymphony.org. Retrieved May 27, 2016. ^ "President Obama to Award 2015 National Humanities Medals". ^ National Endowment for the Arts (June 24, 2010). "National Endowment for the Arts Announces the 2011 NEA Jazz Masters". Washington: National Endowment for the Arts. Archived from the original on September 17, 2010. Retrieved July 19, 2010. For the first time in the program's 29-year history, in addition to four individual awards, the NEA will present a group award to the Marsalis family, New Orleans' venerable first family of jazz. ^ Berger, Kevin (February 6, 2011). "Wynton Marsalis swings for the fences". Los Angeles Times. Retrieved September 6, 2017. ^ Burger, David (February 7, 2011). "Wynton Marsalis in Utah tonight". Salt Lake Tribune. Retrieved September 6, 2017. ^ "Trumpeter Wynton Marsalis Awarded Legion of Honor". NBC Bay Area. Retrieved May 27, 2016. ^ "New York University Holds 175th Commencement". Nyu.edu. Retrieved July 21, 2012. ^ "Honorary Degree Recipients". conncoll.edu. Retrieved November 29, 2018. ^ Lestch, Corinne. "Jazz legend Wynton Marsalis to be June commencement speaker". dailynorthwestern.com. Retrieved October 27, 2017. ^ Byrnes, Sholto. "Stanley Clarke: The Bass Line Heard Around The World". Jazz Forum: the magazine of the International Jazz Federation, Poland. Archived from the original on May 30, 2009. Retrieved May 7, 2010. ^ a b Cook-Wilson, Winston (May 23, 2018). "Wynton Marsalis Responds to Backlash Over His Rap Comments". Spin. Retrieved September 27, 2018. ^ "Books". wyntonmarsalis.org. Retrieved May 23, 2018.